Laura has two nationalities, her dad is German and her mom is Portugese. She grew up in Portugal and skated the European Championship for Portugal before. Then she waited three years to go to Austrian Team, because when you change nationalities you cannot participate in international tournaments for three years. How did the Flanders Grand Prix go? 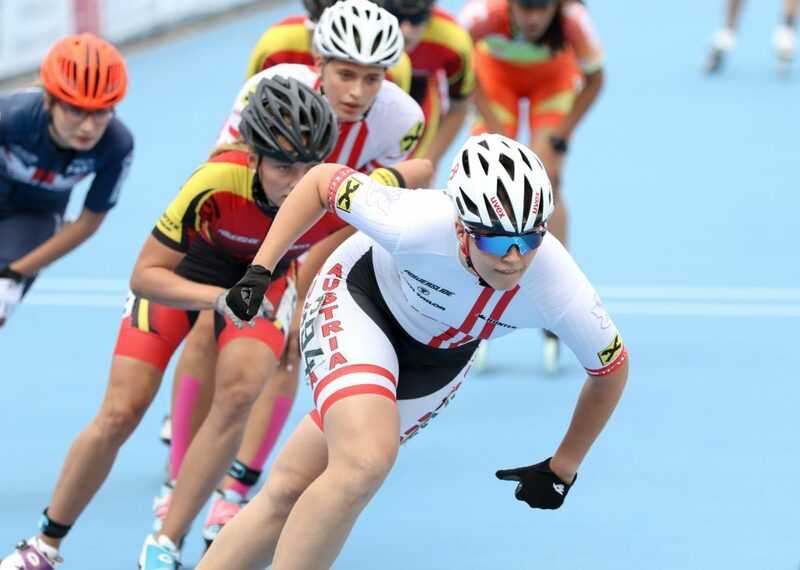 “I was a bit sick on Saturday, the road race is not my race, so I hope the elimination race goes well and in the 300 meter time trial I did my personal best (29.669) so I’m kinda happy.” Laura finished 25th in the overall, with a 13th place in the elimination race. This weekend you raced in the Grand Prix? “Yeah, it was ok, I raced the ones that I wanted. The 1000 meter and later today the elimination. So I hope it goes well.” Kathi finished 23rd in the overall and took an 8th place in the elimination race. Kathi: “I’m going on ice this year, I’m trying to get to Heerenveen to train there. I was at the Summer Camp after worlds with Bram Smallebroek. It was a cool group of skaters, it was fun and we learned a lot. Elma de Vries was one of our coaches. 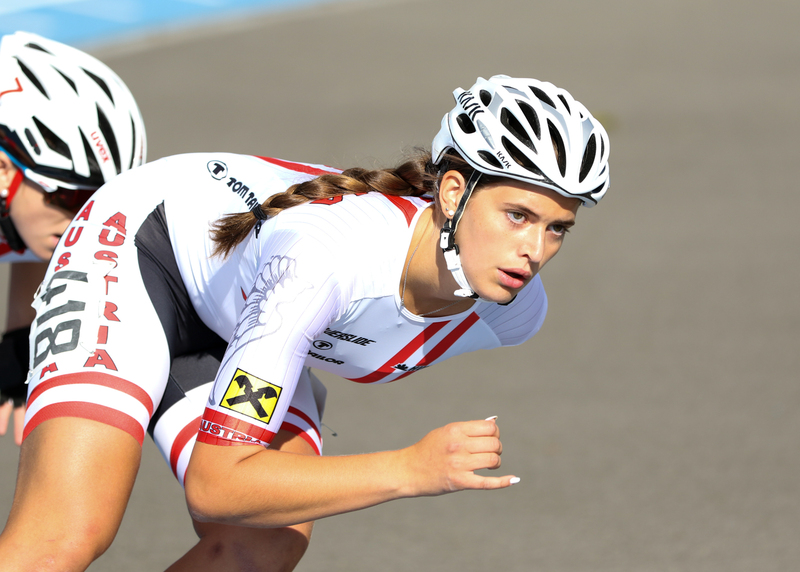 Anna is a member of SC Latella Wörgl and lives close to the track. At the Flanders Grand Prix we didn’t have a chance to talk to her, so this interview took place at the Euros. Was there a plan for this race? “Before every race we talk about the plan with the coach, we go over the race and try to reach some goals. Today we raced for me.” Anna was 14th. Anna was 10th in the points-elimination race, so she wasn’t eliminated and made it to the ‘final’. In the 500 meter she got 13th place. Another great result for Anna was the 8th place in the 1000 meter final. 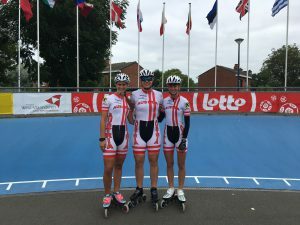 In the teamsprint the ladies didn’t make it to the final and finished 5th. 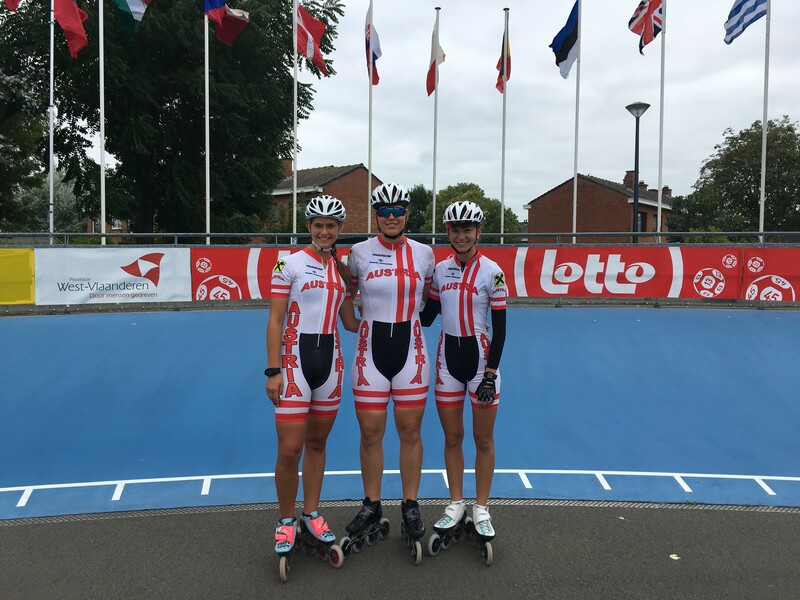 The relay for the junior ladies didn’t have heats, so Anna, Kathi and Laura were in the final. They were up against Italy, Spain, France, Germany and the Netherlands and finished 5th.